Mira Rai once hauled rice sacks through the Himalaya. 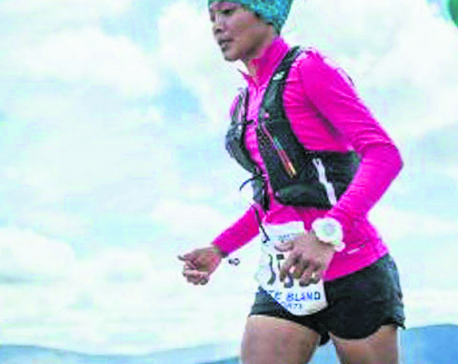 Now she wins international trail races and inspires young Nepali women. Meet your 2017 Adventurer of the Year. Each year National Geographic honors 10 extraordinary people as part of our annual Adventurers of the Year awards. We look for people from all over the world who have realized big dreams in exploration, conservation, cultural restoration, adventure sports, and humanitarianism. And each year we ask our audience to vote for one who inspires them most. While all of this year’s honorees are inspiring—from the cultural renaissance ignited by the Hōkūle‘a celestial circumnavigators, to the unwavering dedication of the Grand Canyon thru-hikers, to the audacious discovery of the world’s deepest underwater cave—one who soared to the top of the voting tally: Nepali trail runner Mira Rai. Growing up in a rural village in eastern Nepal’s Bhojpur Mountains, Rai, 29, had dreams that went far beyond the conventional expectations for Nepali women. The eldest daughter of five children, she was expected to fetch water, tend crops and livestock, and help out at home. By age 12, she had stopped regularly attending school to haul heavy bags of rice up and down steep trails—often barefoot—to trade at the market. It was hard work but also great training for a future trail runner. Maoist rebels came through her village when she was 14, and Rai decided to join them to make money and seek a different life. After two years she returned home never having fought a battle, but while training with the rebels, she excelled in running and karate. But she wondered what she could do with these skils since Nepal doesn’t have a tradition of competing in professional sports—especially women. Two years ago she finally got her big break, by chance. Rai was running outside Kathmandu when two male trail runners invited to enter her first trail race, the Kathmandu West Valley Rim 50K. She had no special gear or training for such a distance—31 miles. She was also the only woman in the competition. Against all odds, she beat everyone, even the men. It was the farthest she had ever run. From there a community of supporters came together to give Rai a chance to compete in international trail running competitions. Today the running world recognizes her as a high-elevation trail racing phenom. And she is on a mission to help both women and men of Nepal through sports. As part of that mission, while recovering from knee surgery last October, she organized a race in her home village. Wasfia Nazreen, the first Bangladeshi person to climb the seven summits and a past Adventurer of the Year, knows first-hand the impact Rai has had on the young women of Nepal. "For someone who has left school so early and missed the learning we take for granted, Mira has been able to turn back time and set a rare example by being the change herself,” she says. “It's hard to find good role models for young women in our region, especially one coming from the same rural village background as most of the young generation. Mira is paving paths not just in terms of being able to speak nationally on gender equality as a woman who has found international success, but by also getting young people into trail running through the new Kathmandu Trail Race Series. The grit and joy she embodies throughout all her hardships and victories, is an inspiration to all of us!" Adventure: Which is more difficult: running a hard, steep trail race or breaking gender stereotypes? Rai: Running is no issue, but breaking gender stereotypes is. For the society we live in, it’s difficult for women and men alike because doing anything out of convention means a lot of struggle—especially for women, who are expected to help out with chores at home from childhood and then get married and raise a family, it becomes a struggle, not merely a challenge. You get called a rebel, and for an adventure sport that involves risks, nobody encourages you. “You’ll end up breaking your bones!” they’d say. Though the mindset seems to be changing, it’s still at a snail’s pace and has a long way to go before women in Nepal’s society are seen as equivalents to men. This is the sad reality. What was your daily life like in the Maoist army? When I enlisted in the Maoist army, I was happy to get 250 rupees [$2 U.S.], which I used to buy basic necessities, like a toothbrush and soap. Then started the training—which included running, physical exercise, hand-to-hand combat, and weaponry with cadets my age. While we were collectively training for a mission, it definitely helped me grow personally, too, because it made me more confident and self-reliant. Under the cover of darkness, we would have to march long hours every day to reach other camps, looking out for each other. I don’t even recall the names of the places we had to traverse, as these were very remote jungles while some were far off villages. We were taught survival skills and acquired many skills I couldn’t have imagined being back home. For two years, I was a part of the rebel army, which was equal parts challenging in terms of training and rewarding in terms of self-growth. It certainly boosted my adventurous spirit. What advice do you have for someone who wants to be a stronger runner like you? It was a matter of chance and luck that I became a runner. Back in the village we had to walk hours on end up and down grueling terrain, often barefoot, with heavy weight on our backs. This definitely contributed. I started running, I got professional training that taught me techniques, and gradually became more determined, motivated, and persistent to chase my dreams. Proper diet and regular training are crucial; however, I’ve learned that taking rest, confidence, yoga, and mental well-being—in addition to having good support from mentor Richard Bull and coach Dhruba Bikram Malla—are just as important to be in shape. You stopped going to school regularly when you were 12. Do you wish you'd had more school? I feel that if I’d finished more school, I would have been able to communicate with more confidence and have a better insight into world affairs. In many cases when I first started racing abroad, I couldn’t even be a part of conversations because of my poor English skills. I used to just sit there and listen, but I didn’t feel uncomfortable being there as everybody was very supportive. However, with media and sponsors, it would’ve definitely been more helpful had I obtained more education back home. Even today when I try to read newspapers, I fail to understand quite a few words. I am taking English classes these days, and it’s certainly helping to improve my English. Running has helped you see the world. What is it like to return to your village now that you have been to Hong Kong, Italy, and other places? I return once a year during the Dashain, the largest festival of the year. The people there are living the same sort of lives as I saw when I was a kid. We used to have kerosene lanterns, but now there are bulbs that run on solar power. The village had no access by road back in the day, now there are dirt tracks that connect to big towns. Mud houses—same. There’s phone connection, but it doesn’t work well. When I go back, I meet a lot of youngsters that ask me how they can live differently. They definitely seem motivated, but sadly their folks do not agree with such ambition. While the physical infrastructure in my village has improved, the mindset has not. I remain hopeful that the future generation will break the mold. Which trail races do you dream of running? 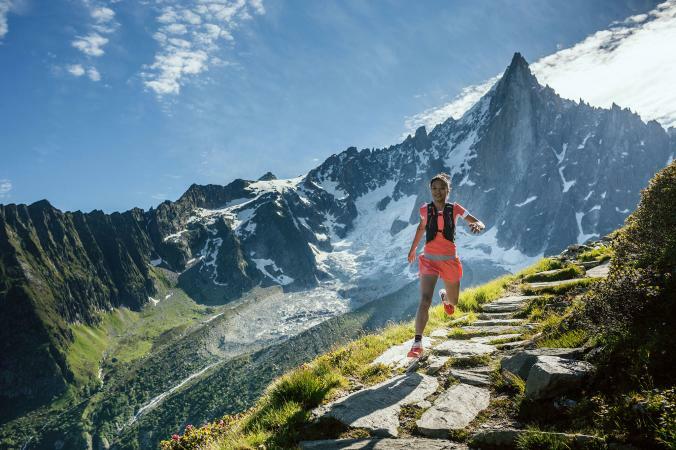 I have always dreamed of running in the Ultra-Trail du Mont Blanc in France. 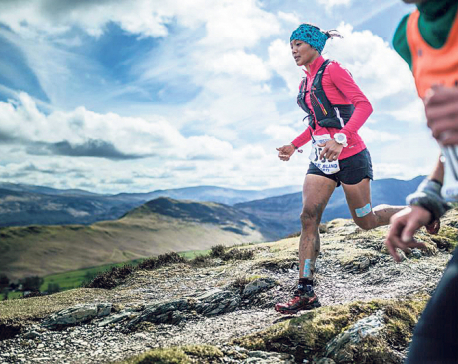 It’s a challenging, 100-mile race for elite runners from all over the world. I would love to see where I stand in this race. What are you going to do to give back now? Recovering from ACL surgery, I have a little free time in hand. I have been providing guidance to men and women alike in running and encouraging them to pursue a career as professional athletes. Every so often, I visit schools and children’s homes to share my knowledge about running, particularly training, diet, and more importantly, an active lifestyle. We have realized that Nepal has tremendous potential to develop competitive athletes, for which we’re organizing a series of trail races in Kathmandu. These are short races aimed for both beginners and experienced runners. I also organized a small race back in my hometown of Sano Dumma last October, to introduce the sport to the young crowd and give them a platform to get interested and noticed in running. In the coming days, I plan to organize races that aim to identify and promote promising runners. 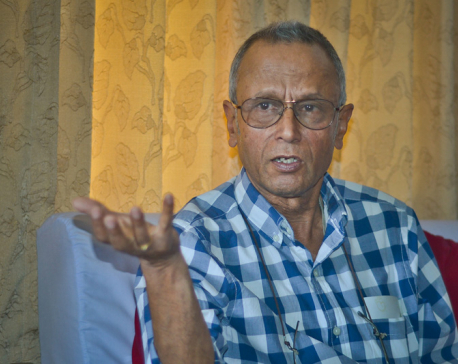 I am also lobbying with the Nepalese government to provision a conducive environment to develop trail running as a mainstream sport and groom existing runners to perform better in national and international races.